This aluminum safety light platform makes mounting high-visibility safety lights a breeze. 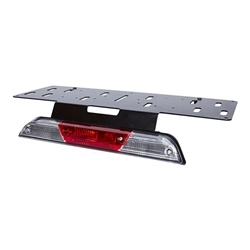 This mount is designed to attach to the high-mounted brake light on model year 2015-2018 Ford F150 and 2017-2018 Superduty trucks. There is no need to drill any holes, the platform uses a clamp and gasket system to hold it in place. This platform was designed to reduce wind resistance. It is made from lightweight aluminum and finished in a UV protected black powder paint finish. Convenient holes are pre-drilled to accommodate most safety light models. If you wish to use a magnetic mount safety signal, you will also need purchase the option with a metal add-on plate. If your truck has a moon roof or brake light-mounted back up camera, please let us know in the Order Notes section of checkout. Please allow an additional 2-3 day processing time for this item.